Have you ever been caught at the end of a presentation when your audience, perhaps a leadership team or a Steering Committee, looks at you blankly and asks this most uncomfortable question: ‘So what?’ How does that help? If you have been in that position once, you don’t want to be there again. You want to know how to answer that question in one single, powerful sentence. Or, even better, set yourself up so nobody asks it. In this practical book, Davina Stanley and Gerard Castles – communication strategists with decades of experience working with everyone from graduates through to the C-suite – reveal their proven approach. Understand why mastering storylining is worth the investment. Learn how to use a storyline to identify and harness the ‘So what’. Master the seven classic storyline patterns. Use storylines to shape the communication you share. Introduce storylining in your business. Packed with examples, stories, insights and practical steps, Davina and Gerard show you how to apply these powerful strategies to stop your audiences asking you, ‘So what? How does that help us? 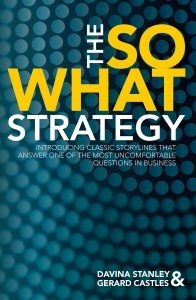 Visit the So What Strategy website to preview a chapter or pre-order.